You'll notice that whilst the first step is an interactive focus, how quickly I've lumped it in with "status quo" or communication (i.e. 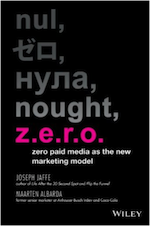 paid media) versus the new maketing, conversational marketing or experimentation sub-sets. That said, spare a thought or a parking space for any of these (or other) companies still dipping their toes in step 1 of the 4-phased roadmap i.e. online advertising. There are still way too many to count and way too many senior marketing positions to be filled.